Where in the world are the Eckunds? We are alive and well in Monrovia, Liberia, onboard the Africa Mercy. So much has happened since our last newsletter, we’ve decided to give you a summary update of the last year. 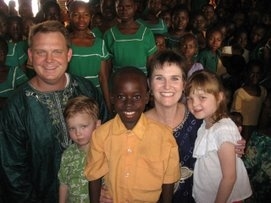 Due to delays in the Africa Mercy’s schedule, we changed our plans and moved to the Anastasis which was in Tema, Ghana. Once onboard, Kreig served as the Information Services Manager, and Karen as the Adopt-A-Patient Coordinator and Long Term Housing Coordinator. 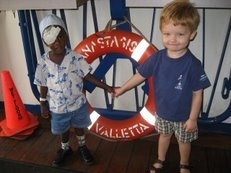 Kaitlyn and Kaleb began school onboard and quickly made friends among the other children. Christmas is a special time onboard the ship where crew share traditions from their home countries. The kids were excited to learn the Dutch tradition of putting a shoe outside your cabin door before bed and waking to find it full of gifts. 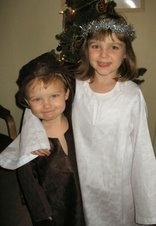 Another highlight was participating in the Christmas play as an angel and shepherd. 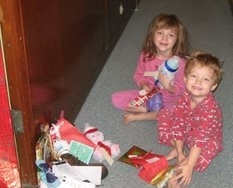 Kaitlyn and Kaleb enjoyed adopting patients who had come to the Anastasis for surgery. After school, and during the evenings, they would bring their patients out on deck to play and get fresh air. As they learned about each others lives, our kids realized how little their patients had in the way of material possessions. Most of the patients had never seen a “playground” and had very few clothes or toys of their own. On several occasions Kaitlyn and Kaleb returned to our cabin to choose an outfit, shoes or toys for their patient. As parents, we were very pleased to see them interacting with compassion, love and generosity – traits we hope they won’t soon forget! To the right: Kaleb with his adopted patient, Patrick, who had a cataract removed from his right eye; Kaitlyn with some of her shipboard friends and adopted patient, Esther. She had surgery to repair her mouth and nose after being disfigured by noma (a flesh eating bacteria) years earlier. 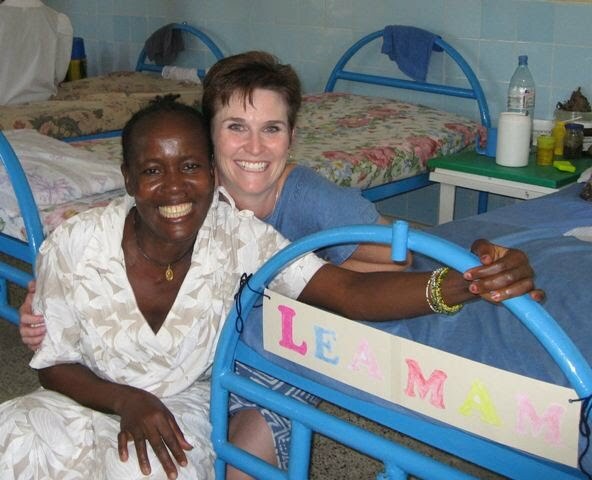 Karen enjoyed getting to know Esi, her adopted patient, who suffered from a vaginal vesicular fistula as a result of obstructed labor. Her story is like many others who have had an obstructed labor. A common scenario: The baby is too large to be delivered vaginally but there is no surgeon to deliver the baby via C-Section, so after days of painful labor the fetus dies and the mother is left with a fistula causing her to leak urine constantly. Often the husband decides to abandon his wife and she is ostracized from normal community life and is left to grieve and suffer alone. The photo on the right was taken at Esi’s “Dress Ceremony” – a time of giving thanks to God, and getting ready to enter into society again with a new dress, symbolizing the restoration of her dignity and renewed hope. One month after her surgery we visited Esi in her village where we had a warm greeting from her family as they expressed their joy over her complete healing and ability to control her urine. While in Texas, we started sponsoring a World Vision child named Joseph. During Karen’s childhood her family had sponsored 3 different children and she had always dreamed of meeting them but never had an opportunity. When we discovered that Joseph lived 300km from Tema and that World Vision would provide a driver to transport our family - it was a dream come true! We enjoyed a 3-day trip inland to Sene, the remote village where Joseph lives. 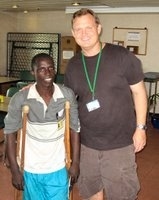 It was exciting to meet Joseph at his school where his classmates greeted us like celebrities. Kaitlyn and Kaleb were overwhelmed by the crowd pushing in to touch their blond hair. The village had prepared a formal welcoming ceremony, complete with tribal dancing/music, speeches from the Chief, Joseph’s Family’s spokesperson and us. It ended with a gift-exchange. Thankfully, we were prepared with gifts for the family, Chief and Elders. Before leaving, we visited the small, one-room hut that is home to Joseph’s family of eight. It was a once-in-a-lifetime experience and left us deeply impressed with World Vision and the difference $30 per month can make in the life of a child and community! Kreig’s parents visited from California! We enjoyed the chance to show them our lives aboard the ship, introduce them to our friends and give them a taste of what life is like in Ghana. They helped us celebrate both of the kids’ birthdays. Kaitlyn (6 yrs) had a pool party at a local hotel where she enjoyed swimming with all of her classmates, eating pizza and a princess cake under a thatched cabana overlooking the ocean. Kaleb celebrated his 3rd birthday on board the ship with his preschool friends. 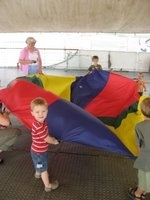 Some of the highlights included a “Lightening McQueen” birthday cake and parachute games on Aft Deck . Kreig’s parents brought photo albums that we had printed for our adopted patients and helped us deliver them – offering a glimpse of life in a rural village. 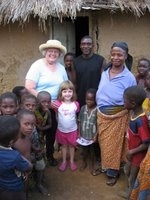 The photo on the right shows Kaitlyn and Grandma with Naomi (Kaitlyn’s patient) and her Grandma in front of their hut. Seeing the conditions in which Naomi lives was quite shocking for Kaitlyn. Naomi lives with her Grandma in a mud hut with thatched roof, dirt floors, no electricity or running water, and only eats 2 meals a day, if they have the money. The Anastasis sailed from Ghana to Liberia. Liberia was founded by freed American Slaves and the government was modeled on the American constitution. Over time, corrupt leadership led the country into civil war and destruction. From 1989 to 2003, Liberia suffered from a civil war which almost completely destroyed the nation. Many fled the country or headed into the bush. Children became soldiers and as a result, there is now an entire generation that is unschooled. In 2003, 14,000 UN Peacekeepers came to Liberia to bring stability and peace to the nation. In 2005, Liberia elected a new president, Ellen Johnson Sirleaf, the first female Head of State in Africa. This tenuous peace has resulted in a fragile hope that they will now be able to rebuild their lives and community. 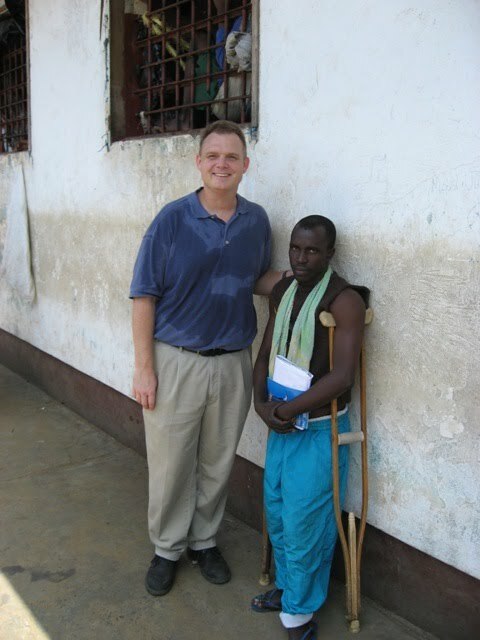 Kreig began visiting Monrovia Central Prison every Saturday with Prison Fellowship. The Justice System in Liberia is broken down – as a result there are 700 inmates in a prison designed for 200. Almost none of the prisoners Kreig has met have stood trial, even after years of being in prison. In the photo on the right, Kreig is standing with KS, who is accused of murder. It’s an unbelievable accusation – that KS, who walks with the aid of crutches as a result of polio, dragged a young boy from the market and brutally murdered him with a broken bottle and then reported it to the police himself! He is still awaiting his trial after more than a year in prison. Kreig and KS enjoyed their weekly visits and often spent time talking about what he had recently learned through a Bible correspondence course. Karen began visiting the Sisters of Charity. She visits women who are sick with HIV/AIDS and/or tuberculosis. It is not uncommon to lose one patient per week. During one visit, they made “name tags” for their beds and talked about family names and the chance to be children of God. It was a meaningful discussion in a place where individuality and identity are often lost. A month of big decisions! Although our commitment was to stay until June, we decided to stay longer when we learned that Kreig’s replacement was unable to come. This would have left the ships in the middle of a major transition without an IS Manager – so, we agreed to stay until December when the Africa Mercy would leave Liberia. Our decision to stay longer allowed us to pursue another desire that our family had been praying about for almost a year. 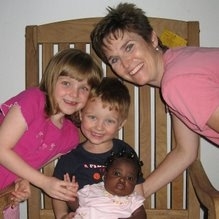 We decided to adopt a child from Liberia through Acres of Hope. Four other Mercy Ship families have adopted children through this orphanage/adoption agency and have had a very positive experience. 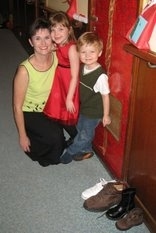 The director, Patty Anglin, is an American who has adopted 9 children. Her agency, Acres of Hope, is registered in both Liberia and the U.S. Patty completed our home study and then we waited to be matched with a child. 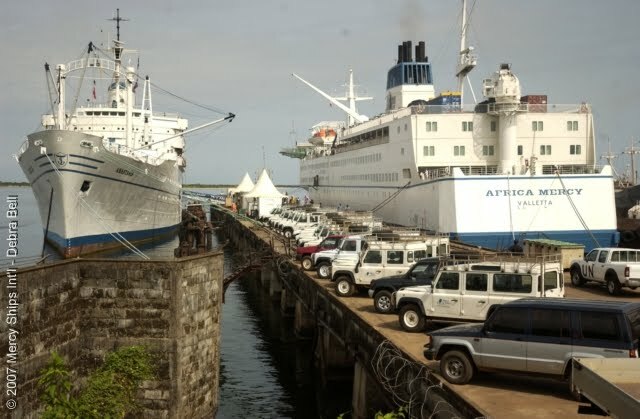 The Africa Mercy arrived in Liberia and we began the one-month project to move operations from the Anastasis to the Africa Mercy. This was quite a challenge for Kreig and his team in Information Services. They had to decommission all of the Anastasis computer equipment (160 PCs, 10 servers, two satellite systems, 30 printers and photocopiers). An even bigger challenge was to move all of the user accounts, email accounts and valuable data without losing track of anything during a time when the users still needed access! It was like trying to assemble an airplane while it’s already in mid-flight! However, by the end of the month, we were up and running on the Africa Mercy. The physical transition between the ships was completed, but it would take several more months to finish getting things organized in many areas of the ship. The Anastasis sailed to India where she was sold as scrap metal. Surgeries began on board the Africa Mercy. We went to Europe to debrief the past decade with Mercy Ships at a Missionary Care Center in France. It was very helpful to look back over the past ten years and recognize the good and bad times and then prepare to move on to our next season in life. Kreig’s parents met us in France to watch the kids during our debriefing and then treated us to a week on a canal boat where Kreig got to be “Captain”. Kreig’s brother, Karl, and wife, Elaine, also joined us for a wonderful week together. 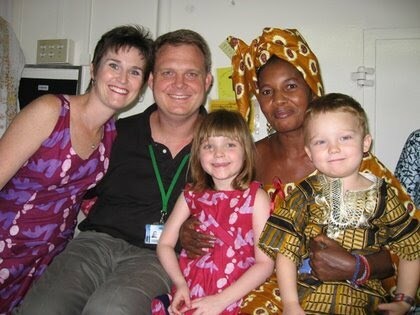 We returned to the ship from Europe and waited excitedly to be matched with our new Liberian child. KS is finally released from Prison after 13 months! After more than a year without any trial, or any further reason to hold him, Prison Fellowship is able to convince the courts to release him. The picture on the previous page shows KS visiting in the Africa Mercy Dining Room. We began the process of selling our home in Texas in preparation for our intended move to California in December. We completed the sale of our house and had our belongings moved to California, thanks to the hard work of many great friends in Texas and California. 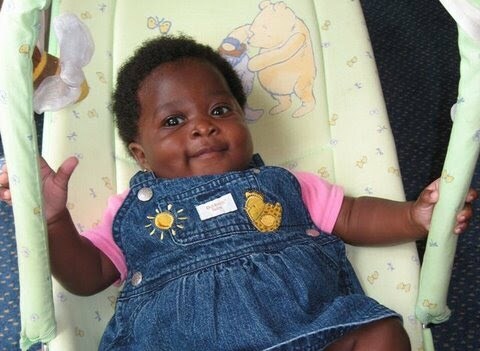 We received word that the Liberian part of the adoption is now finalized and Keyara has a Liberian passport. Now we must wait and pray that Keyara will receive a U.S. Immigration Visa before the ship sails from Liberia at the end of November. On December 10th we’ll fly from the Canary Islands to San Francisco where we will be renting a home on the property of Foothill Covenant Church in Los Altos. Kreig will begin looking for a job and finishing up some final consulting work with Mercy Ships. We are eager to be near our families again and look forward to re-connecting with many of you and sharing more about our year abroad. We continue to be amazed at God’s faithful provision through so many people who have partnered with us to make our work possible. Thank you for the part you have played over the years! Address (after Dec 10th): 1575 Oak Ave.
Kreig will be looking for a job in the San Francisco Bay Area. Kreig holds BS and MS degrees from Stanford University in Mechanical Engineering. He has held positions involving Manufacturing and Test Engineering, Financial Operations, IT Support, IT Management and IT Executive Leadership. He is interested in positions involving mechanical engineering for product design, software engineering or IT system engineering. If you have any contacts or leads that you think would be helpful, please let us know! Mercy Ships will continue to process financial donations for our family until February 1st, 2008. Contributions can be made by mailing a check to: Mercy Ships, Attn: Donor Service, PO Box 2020, Lindale, TX 75771-2020 and including a note that says: “For the Support of Kreig and Karen Ecklund”. Online giving and other giving options can be found here. We could use hand-me-down winter clothes for the kids as we have been living in a summer climate for the last year. The kids’ sizes are: Kaitlyn 6 - 7, Kaleb 4 and Keyara 6 to 12 months.